To the left, you will find a graphic representation of the transcendence that occurs when the Closed System of Disease that is designed for failure is re-framed into the Open system of the Natural Order during the Ceremonial Change Process. When a person denies the unifying principle that all creation is Inter-related, this is “stress”. All of the diseases are a consequence of denying our oneness with the creator’s will-to-love. All Navajo healing ceremonies reawaken a person to their true spiritual Self-identity as a precious child of creator made of the four sacred elements: air-spiritual; fire-mental; water-emotive; earth-physical body. When any one of these elements is out of balance, there is dis-ease with creator’s will-to-love that manifests as disease. 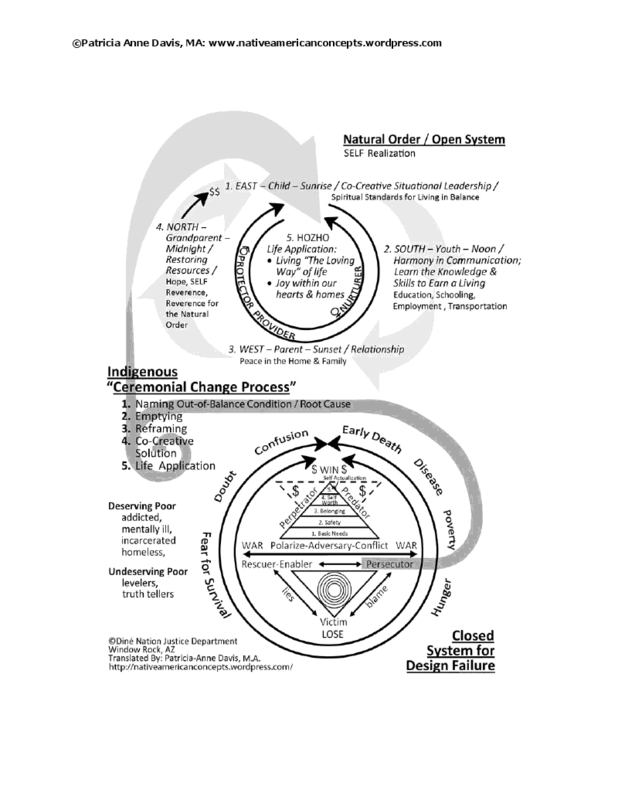 This entry was posted in Articles, Ceremonial Change Process, Co-Creative Solutions, Living the Loving Way, Native American Concepts and tagged ceremonial change process, chocktaw-Navajo/Chahta-Dineh, co-creative solutions, dis-ease, disease, healing, indigenous medicine, indigenous wisdom, Native American, native american concepts, native american wisdom, Natural Order, Patricia Anne Davis, Social System, The Blessingway by Patricia Anne Davis, MA Choctaw-Navajo/Chahta-Dineh. Bookmark the permalink.